One of my favorite things about Larian's Divinity: Original Sin videos is the obvious and unbridled enthusiasm that founder Swen Vincke has for pretty much anything that catches his eye. Today's Kickstarter update video, an overview of the many changes that have been made to the upcoming Enhanced Edition, is no exception. Much of the material covered in the video, filmed at the official Larian Studios Living Room Experience Simulator—a beanbag on the floor—is already known, although the inclusion of a 360-degree view was news to me. But it's still very useful for anyone who may have missed some part of it or other. The split-screen multiplayer appears to be simple and effective, as does the controller support. Visual and audio effects have been improved, and every single line in the game is now voiced. Much of the dialog has been rewritten as well, to make things clearer and, hopefully, smooth out some of the rough bits. 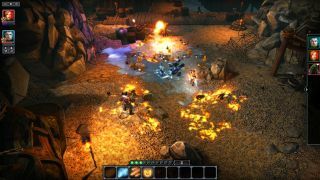 It will also offer rebalanced combat with a couple of tougher game modes, an entirely new ending, more NPCs and monsters, and numerous improvements to the game engine that should improve performance considerably. Divinity: Original Sin Enhanced Edition comes out on October 27, and will be free for anyone who owns the original. Remember that it will be an entirely separate game in your Steam library and not an update, and that saves from the original are therefore not compatible.